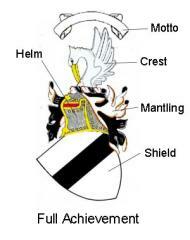 Beginners Heraldry - The Heraldry Society of Scotland. A person who has arms is called an armiger (figs1 & 3) and his family is considered armigerous. Men bear their arms on a shield and women on a lozenge or more recently on an oval, although this is not a binding rule. A woman usually uses her husband’s arms on a shield (fig1) while he is alive and on an oval or lozenge (fig 2) after his death. A daughter may also use her father’s arms on an oval or lozenge (fig 2). If a daughter marries an armigerous man, she may impale her arms with his (fig 4); the impaled arms are usually displayed on a shield, but to be absolutely correct the wife would use a lozenge. If she is an heraldic heiress, that is she has no brothers, her children may then quarter their father’s and mother’s arms together (fig 4a). My thanks to Raymond S. Morris of Balgonie and Eddergoll for the use of his and his family's arms.